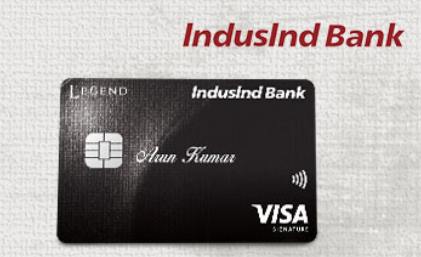 Indusind Bank has recently launched a new credit card to their portfolio under Visa Signature variant and called it as Legend Credit card, in some places they also mentioned it as Signature Legend credit card. This appears to be positioned anywhere between Pinnacle credit card and Signature credit card variants but is infact better than Pinnacle credit card if used with a strategy as mentioned below. Good to see new set of brands with indusind these days. Yatra voucher is best fit for those who fly often, else, Pantaloons/UCB/Woodland gives good value for money as well. Note: They no longer issue vouchers on 10k Variant. 4000 bonus reward points on spends above 6 lacs from the card issue date. The bonus points will be credited post completion of 1 year. Though they’ve mentioned “You can also enjoy free visits in a year to international Lounges located within India and abroad.” in their website, there is no proper info on that. In meantime, they’ve recently added free Priority pass visits to Pinnacle card. Enjoy a partial wavier on Foreign Currency Mark-up on your Foreign Currency Transactions till 31st Dec 2017. The foreign currency markup will be charged at 3.5% and the differential amount will be credited end of calendar month on the cardholders card account. That’s a nice move on Forex Markup fees, this feature makes this card to the list of best credit cards for international use. With a decent reward rate and a nice spend based bonus, Indusind Bank Signature Legend Credit Card is a pretty nice offering with the kind of joining fee they have. However, you need to spend only on weekeneds to get the maximum value back, which makes it little bit tricky. What’s our take on the new Indusind Bank Signature Legend Credit Card? Share your thoughts in comments below. For me, it seems Iconia is better than this in terms of joining fee and reward rate. What is your say Sid? But if there is a reasonable upcoming spend on these voucher brands, its good to go on this as well, mainly for low markup fee. Bank guys called asking me to upgrade to this card even though I upgraded to Iconia Amex just last month. They offered me to convert my existing 5k points on Iconia Amex as a joining fee for this Signature Legend Card. Plainly refused!!! Nice, Whats the special feature you’re enjoying with Iconia? 4. Low joining fee compared to this new Signature Legend card. Yes it seems 10k introductory offer expired last month. Instead spending here, you can also get Yes Preferred card/Regalia for free. My average spend is around 20 lakhs a year as I use it for business purpose too. I like using rewards to pay back card balance then storing miles etc. Does Yes Bank or Regalia offer better cash back reward than this? Cash Advance fee is zero. For international travellers this will be very good. No need of forex card. You will be paying 1.8% extra above the spot rate. But Finance charges applicable on cash withdrawal. I had a question about Indusind credit card. I got a call from their sales guys and he offered me a LTF card for Indusind Platinum credit card. He sent me a brochure and the card looked good. Do you have any knowledge about this card? I combed through the website, but I did not find a review. Very little is available elsewhere too. Due to the bad reputation of IndusInd, I’m hesitating about it. Its a basic card. Will review it shortly. I have a indusind legend card and I m using it for business purposes, I heard it from somewhere that’s its not good to use it for business purposes as Income Tax Department can ask questions, is it so? Ofcourse! Will explain more in detail in a separate article. Hi Sid. Please explain consequences related to Income Tax Department because of High Usage of Credit Card. Thanks. Long time pending one. Will do shortly. Thanks for reminding. So, can we expect te articcle soon?? Just applied for the Legend card today. IndusInd is running a promotional offer where all new cards and existing IndusInd credit cards (lower variant) can be upgraded to the Signature Legend at Rs 6,999 + taxes (18%) as a one time joining fee. No welcome benefits provided though. Joining fee with welcome benefits remains same at 25k + taxes (18%). Got it from the home branch directly. Was not able to check if it works for the online application as well. 7k+GST is too much for this card! Any particular reason you opted for this? 1. The cash credit is quite rewarding in the current landscape after various devaluations from other banks. Effectively a little over 2.5% if done on weekends and achieving 6L spends a year. 2. Plan to split the overall expenses between the cards I hold currently i.e. YesFirst preferred, Amex Gold & Platinum and the applied Legend. 3. Cash credit on Fuel spends as well along with a Fuel surcharge waiver. Handy for the heavy fuel consumptions I have in a month. 4. I use the golf benefits regularly given by the Mastercard powered YesFirst preferred. Plan on using the golf benefits given by the Visa powered Legend for a few other golf courses not covered under Mastercard occasionally. 5. BOGO tickets on Bookmyshow (3+3 in a month) is a handy feature to take the family/friends out for a Movie. 6. Support from Indus Exclusive customer support is prompt and apt if ever needed. Not as courteous as the Amex people but they get the job done. Also, the physical bank is walking distance from my place of work, if any support is ever needed. 7. Entry to Visa Signature with the hope to upgrade to Visa Infinite in the future. 1. Joining fee is indeed extremely high. Convinced myself to get it cause of the cash credit I had generated over the last one year from Indus Exclusive Platinum Debit card. 2. The online/offline tie-ups for cashbacks and rewards are less in comparison to other banks. Hopefully, they get aggressive soon with it in future. 3. Their lounge program is a mere formality. But the YesFirst preferred & Amex Platinum are there to balance it out for both Domestic/Internation lounges. Will be able to share a better review after having used the Legend card. I get it. But it seems they’re removing cash credit option on credit cards. They’ve already removed for debit cards from August 2017. If i should upgrade why? i am having indusind platinum select card with Rs.3 lacs limit since 2013.
which indusind card should i try for upgrade. Is there an annual fee apart from the joining fees? The executive told me there is only joining fee and no annual fees, is that true? Upgraded from Indusind Iconia AMEX to Indusind Legend. Will receive the same within 8 days. Got almost Rs. 14000 /- last year with Iconia Amex 2% weekend rewards, a real gem of a card. However fed up of the non acceptence of AMEX at POS in Nagpur, Petrol stations, Amazon, Snapdeal sale etc. Upgrading to Legend with heaps of benefits for me. Though joining a bit higher (10 K + GST without gifts), but worth the benefits. Advantages over Iconia AMEX – Weekend 2 % rewards (same as Iconia AMEX), 3 free tickets in a month on BMS with additional 50 Rs. off on F&B option (current offer – max 300 off on thu, fri, sat & sun), Foreign currency markup 1.8% till mar 2018 (I Travel atleast once a year international), No ATM cash withdrawl fees for lifetime ( great in emergencies), Fuel waiver 1% with reward points applied (Iconia AMEX not accepted at Fuel stations even not on HPCL in Nagpur), Contactless card, 2 RP at weekends, 1 RP at Weekdays, 1RP = 1 Rs., Bonus 4000 RP on crossing 6 lakhs spends in 1 year. I think i did the right thing upgrading to Legend. Comments are invited ! I don’t think is a right choice as you need to spend a LOT to get the value back. You could’ve instead used some other visa/mc as backup card like SBI prime or Yes First preferred. Its anyways fine if you get value back through BMS. Seems like the number is not engraved on the card. How do you make online purchases then? It is on the back side of the card. Discounted Foreign Currency Markup fees of 1.8% extended till 31 Dec 2018. I got my account upgraded to Indusind SELECT Savings account on basis of having a Legend Credit Card. Also, no need to maintain an Average Quarterly Balance (ie. a Zero balance account). They do this if you are holding the following credit cards – Legend, Signature, Odyssey Credit Card. I have HDFC Diners Black card and SC titanium super value. I am looking forward to have one more premium card but on visa/MasterCard to balance my diners. I am not sure which card should i go for. Please can someone advise. P.s Yes bank has rejected my application for yes preferred credit card, which i am negotiating with them. Hope, they will re consider. You can simply ask SC to upgrade your SC titanium cuper value to Ultimate, It has exact ly same reward rate of 3.3% and better redemption options. Indusind cc team is offering this Legend or their Signature credit card on 10K joining fee+ gst, with equivalent vouchers as mentioned in the above post. Is it worth to accept the offer considering I am new to Indusind with no relation so far. Or can I get better offers if I wait little more. 1. Upgrade to Diners Black from existing Clubmiles. 2. Acquire new SC Ultimate Card. 3. Acquire new YF Exclusive Card. Indusind Credit Cards are running a month long festival named “The Rewardz Festival” starting 10th October to 10th November. However, one must register to receive the offer. I recieved such an sms stating the communication. Those who haven’t received the sms may simply type JOIN and send it to 5676757. You will be enrolled and be given a registration reference number. And, await the offers starting 10th October. Offers are not yet disclosed, only T&Cs are disclosed. Can you connect me with person who gave you this card for 10K + Tax along with vouchers. or 10K + Tax without vouchers. They’re correct. No vouchers on 10K variant for now. ₹10000/- Voucher redeemable at either Tanishq/GRT or Joy Alukas Jewellers. The offer seems to good to be true. How can I verify the authenticity of these claims since all the information is shared over call and I don’t have it in writing. Thoughts ? I don’t think such offer would be legit. First of all no bank will give welcome gift more than what you pay. You pay 10K and getting 15K welcome vouchers doesn’t sound legit to me. I have IndusInd credit card too, they won’t reverse the joining fee AFAIK. How the bank will get benefit if they give you welcome benefit as well as reverse the joining fee? Could be a fraudulent attempt to gather your personal information. All calls are recorded and can be relied upon. Also you may try to get the same on email/ in writing but I’m quite sure that won’t happen. Just be sure to ask for T&Cs during the call and that there no surprises. I have a legend card and i wann to know if we use in a city like dubai so what will be the extra charge and can i be applicable to get reward point. Apple Launched its Own Credit Card – Will it come to India? Raj Pandya on Apple Launched its Own Credit Card – Will it come to India?